This was a lengthy book on prophesy which is now available on Kindle. 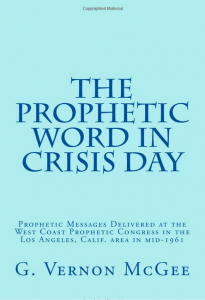 These messages were first given in Southern California at the West Coast Prophetic Conference in 1961. Authors included John Walvoord, J. Dwight Pentecost, John Woodbridge, J. Vernon McGee, and others. These were messages confirming the pretribulational and premillennial comings of Christ. It also contains much good material on the condition of the world in the end times.